HOLLYWOOD is now actively crushing our children’s hopes and dreams. 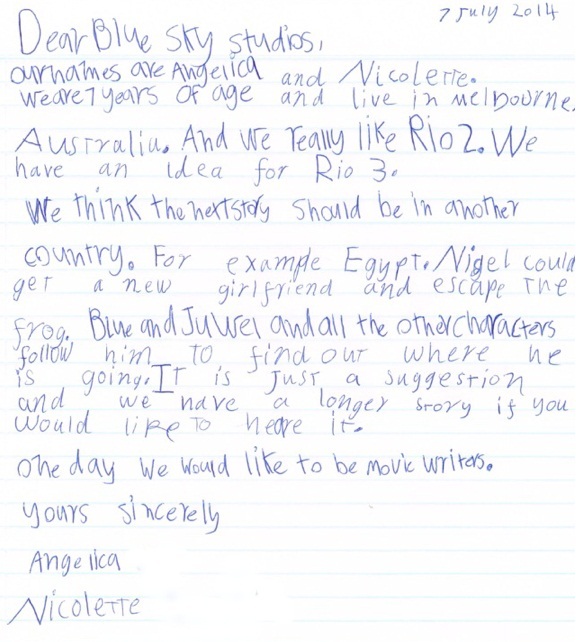 A pair of 7 year old Melbourne schoolgirls recently hand wrote a letter to the US producers of their favourite movie. The proposed plot would take place in Egypt, they wrote. The girls kindly offered to send the studio more detailed plot notes, concluding with maximum adorableness: “One day we would like to be movie writers”. 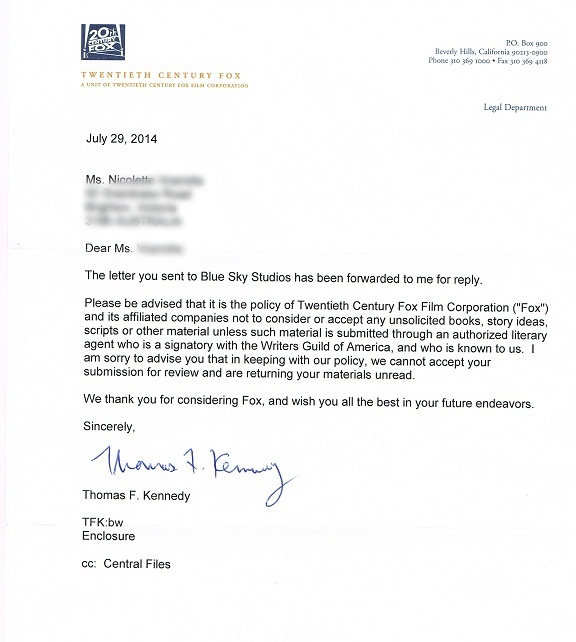 But the grey-suit-wearers at 20th Century Fox were unmoved. “We cannot accept your submission … and are returning it unread,” they thundered in a cheerless, typed response. The studio said it would only consider the SEVEN YEAR OLD GIRLS’ MOVIE PITCH if it was “submitted through an authorized literary agent who is a signatory with the Writers Guild of America, and who is known to us”. One of the girls’ mums was flabbergasted. “When I arrived home after work yesterday and saw the letter from 20th Century Fox I was quite excited, as was [my daughter],” she told me via email. “I was expecting the usual ‘thank you for your interest, we encourage you to pursue your dreams, of course we don’t accept pitch ideas but it’s cute coming from two 7 year old girls halfway across the world, we are glad you are such fans of the movie’, or something to that effect,’ she said. How can film producers that frequently tells stories of plucky young kids pursuing their dreams and overcoming adversity be so… so… soulless? And without any sense of irony. But the girls — like heroines in their own heartwarming animated film — are pushing on, trying to get the Hollywood heavyweights to reconsider their (dare I say, excellent) Rio 3 proposal. If you’d like to help encourage 20th Century Fox and their subsidiary Blue Sky Studios to respond to the girls’ movie pitch please tweet them using the #reconsiderrio3 hashtag. CLICK HERE TO TWEET THE STUDIOS. Nigel and Frog (© 2014 Fox). I’m thrilled to let you guys know I’ll be joining Channel Ten’s The Project as a field producer. All good things must come to an end. And while it’s been a privilege to rub shoulders with some of Australia’s top thinkers and policy analysts at the University of Melbourne these past few years, my first passion has always been journalism. I love that moment when people finally agree to be interviewed. I get a rush when somebody says “I’m rolling” and a little red light turns on. I like making it my business, literally, to know what’s happening in the world. News junkies represent! This move has nothing to do with the University’s current restructure, although when an organisation pauses to consider its future it presents individuals with an opportunity to do the same. I wish my University academic colleagues all the very best solving the world’s grand challenges, and I wish my soon-to-be-former media team comrades all the very best making sure people out there hear about it (that’s right, those punters I bang on about). I will start at The Project — a product of Roving Enterprises — in late July. Got a story? It’s never to soon to email me or anonymously fill in the below form. P.S. : If you’re interested in what The Project’s field reporting team actually does, here are some recent stories on topics as diverse as voluntary euthanasia, transgernderism and human travel to Mars. When a troublesome child is chastised for bad behaviour they’re often quick to point the finger at somebody else, as if that other child’s wrongdoing might somehow lessen their own guilt. New research suggests this very natural ‘Look! Over there!’ impulse — enacted on an international scale in the 1970s — might have spurred enthusiasm for what we now call “human rights”. Melbourne historian Dr Barbara Keys argues human rights are today’s moral lingua franca – the universal language in which we couch our aspirations for human betterment. “Though they can seem like a timeless truth, it was not until the 1970s that ‘human rights’ became a household term and a global rallying cry,” she says. Dr Keys’ new book Reclaiming American Virtue: The Human Rights Revolution of the 1970s seeks to identify the impulse at the core of this “new moralism”. Surprisingly, it locates the roots of the modern human rights movement in Americans’ traumatised psychological state after the Vietnam War. “It is hard to overstate how deeply unsettling the war was for Americans, whose faith in their country’s benevolence was profoundly shaken by the war’s extraordinary brutality,” she says. “Martin Luther King Jr. famously called the United States ‘the greatest purveyor of violence in the world’ and many observers around the globe agreed. At home, liberals in particular felt ashamed and guilty. Which bring us back to that naughty young child dobbing in a friend. Dr Keys argues increasing moves by the US to shine a light on the wrongdoing of other nations may have been less about actually preventing atrocities, and more about creating a distraction from America’s own sense of national shame. “As I see it, promoting international human rights was not a ‘natural’ response triggered by an epidemic of human rights abuses, or by a cool-headed rethinking of Cold War anti-communism. “Instead it was a kind of sleight-of-hand, whereby Americans turned the spotlight away from America’s own recent history of violence to focus instead on brutal torture by nasty dictators in places like Chile and South Korea. At the same time, however, another dynamic was at work. Dr Keys uncovers a largely forgotten conservative strand of human rights promotion, one that sowed the seeds for the neoconservative enthusiasm for human rights and democratisation that defined the George W. Bush era. Indeed, it was the men and women who would don the neoconservative label a few years later who first introduced international human rights into mainstream American political vocabulary in the early 1970s. “These conservatives found liberal guilt enraging. They rejected any effort to blame the United States,” Dr Keys notes. Jimmy Carter, when he became president in 1977, made international human rights promotion one of the central pillars of U.S. foreign policy. His advisers told him human rights appealed to both liberals and conservatives, and could help heal the psychological damage the war had caused. But Dr Keys believes Carter failed to reckon with the irreconcilable divergence between liberal and conservative visions of human rights, which prioritised very different rights and were aimed at very different targets. “Though the new policy was hobbled by unresolved contradictions, including the tension between liberal and conservative visions of what human rights were, Carter gave the new mantra the full backing of a superpower and thereby almost single-handedly ensured the rise of human rights to its current status in the global moral imagination,” Dr Keys says. Her explanation for the rise of human rights makes the arc of US foreign policy sentiment since the end of the Vietnam War more understandable. Meantime, the liberal version of human rights similarly derived from a failure to reckon with the true costs of American interventionism in Vietnam. The neocons who would plot the invasion of Iraq after the election of George W. Bush had first embraced the moralism of human rights as a rejection of guilt for the Vietnam War. Human rights made renewed interventionism more thinkable, not less – which is why so many liberals could end up supporting Bush’s war for human rights. 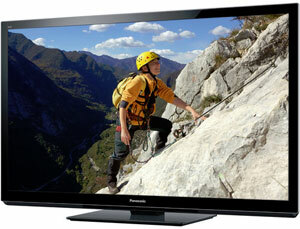 Laparopscopic surgeons may improve certain aspects of surgical performance by regularly playing on a Nintendo Wii, according to research published in PLOS ONE. Researchers analyzed how a four-week training regimen on the Wii impacted the laparoscopic skills of post-graduate residents in the first or second year of their surgical training. Half the surgeons were assigned to a training regimen on the Wii while the other half were not. Before and after the regimen, all the participants’ performance was tested on a laparoscopic simulator. The study found that participants in both groups improved their skills over the four week period, but those who had been trained on the Wii showed a significant improvement over the other group in their performance on several specific metrics like economy of instrument movements and efficient cautery. Australians opted not to gamble away last year’s carbon tax compensation as they had earlier government payments, according to a University of Melbourne study. Researchers explored whether the 2012 carbon tax cheques sparked an increase in expenditure at the pokies, as had occurred following the economic stimulus payments of 2008 and 2009. The study found many recipients were more restrained in 2012. 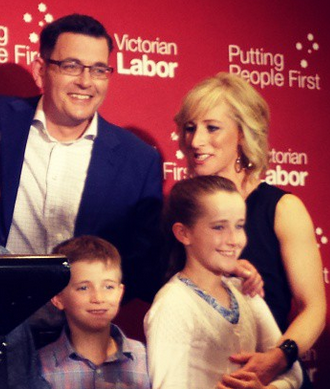 “The Carbon Tax cheques arrived when people were expecting a hike in their power bills. They were portrayed as a rebate on rising costs of living due to a ‘big, new tax’,” said researcher Hielke Buddelmeyer. Conservatives are happier than liberals because of their strong ties to a large network of social groups, according to new research. A research team from UQ Psychology conducted a study among 816 undergraduate students to explore the link between conservatism and happiness. UQ Psychology Professor Jolanda Jetten said the findings indicated that conservatives were happier than liberals due to greater access to social capital – a great source of well-being. It appears what makes conservatives happy is not conservative ideology but rather a “social and material advantage” – that is, access to groups, participation, membership, etc. So maybe money can make you happier?